So as much time as I’ve spent outside in my life I had not slept outside alone ever until the other night! 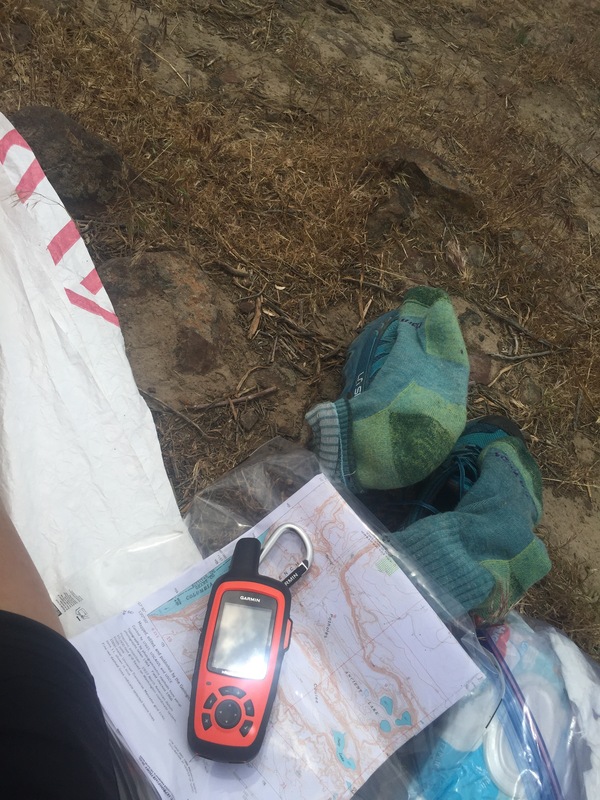 I created the route on my computer and then put it on my gps plus I had paper maps and a compass for practice too! Here is a shot of my map reading and checking in on the gps during lunch! Since this was the first time I had made a route for myself and I was making it a loop so I could get back to my car …. I made it a little too loopy and only did about half of what I had made but more than the area really had to offer. I was still so proud of what I had done as I was 100% alone and only saw 2 guys coming back to their car in the morning when I was going out and 1 other guy on the way back to his car the morning I came back out too…but he was on the other side so I literally saw no one! Kinda cool and kinda weird at the same time. Me in my tent relaxing! I was surprised at how natural things felt. I had all these preconceived ideas in my head that I would be scared, that sounds would wake me up or that I wouldn’t be able to sleep but I did! Maybe it was from how tired I was and there just weren’t any sounds besides birds but…it still felt remarkably easy for what I had envisioned in my head. The waterfall I collected my water from! I woke up to rain the next morning which was good practice for being wet and drying everything out! I was intending to go to a second location after my 2 days there but the weather just wasn’t cooperating and I was still in shock from my grandma passing that I headed back home! All in all a great day in the woods! Until next time! Happy Trails!